Dr. Laura Markham has been featured or quoted in thousands of print and online publications as diverse as The Wall Street Journal, Men's Health, Redbook, Parents Magazine, Real Simple and the The Boston Globe, as well as being a regular guest on radio and national television. 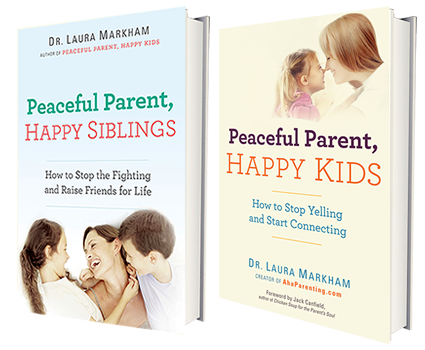 Media-savvy, high-energy and able to connect with parents, Dr. Markham offers expertise and commentary on every aspect of parenting. Who is Dr. Laura Markham? Dr. Laura Markham earned her Ph.D. in Clinical Psychology at Columbia University, but she's also a mom, so she understands how tough it is to be a parent. A leading advocate for parents and children, Dr. Markham is the founding editor of AhaParenting.com, an extensive website serving up Aha! Moments to parents of babies through teens. Her bestselling books include Peaceful Parent, Happy Kids: How To Stop Yelling and Start Connecting, and Peaceful Parent, Happy Siblings: How To Stop the Fighting and Raise Friends For Life, which have been published in 12 languages and continue to rack up daily five star reviews on Amazon, as parents attest to the power of her approach of connection, coaching, and parental self-regulation. Her latest book is The Peaceful Parent, Happy Kids Workbook: Using Mindfulness and Connection to Raise Resilient, Joyful Children and Rediscover your Love of Parenting. Dr. Markham's Facebook and Twitter have large and active followings who are engaged in applying her ideas. She writes a weekly coaching post to a rapidly growing list of over 130,000 subscribers.